Master off-duty by opting for an Etro Button Up Blazer and white capri pants. Hesitant about how to finish off? Add white leather high top sneakers to change things up a bit. We all seek comfort when it comes to dressing up, and this combination of an Etro button up blazer from farfetch.com and charcoal leggings is a great illustration of that. White low top sneakers work spectacularly well here. Fashionable and functional, this combination of an Etro tan blazer and navy plaid skinny pants provides with variety. The whole outfit comes together if you round off with a pair of black leather pumps. If you're scouting for a casual yet totally chic look, try teaming an Etro button up blazer with white tapered pants. Both pieces are totally comfy and will look fabulous together. White leather wedge pumps complement this outfit very nicely. If you gravitate towards off-duty style, why not take this combination of an Etro Button Up Blazer from farfetch.com and white flare jeans for a spin? White leather loafers pull the look together. 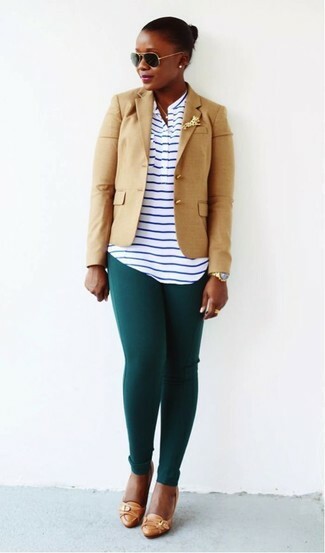 A tan blazer and dark green leggings are an easy way to introduce effortless cool into your daily off-duty arsenal. Add tan leather pumps to the mix to completely shake up the outfit. This combination of an Etro tan blazer and tan wide leg pants is a foolproof option when you need to look great but have no extra time to pull together an ensemble. For a more casual twist, complement your look with black and white leather low top sneakers. This combo of an Etro Button Up Blazer from farfetch.com and blue flare jeans is perfect for off-duty occasions. And if you want to instantly kick up the style of your look with one piece, add black leather ankle boots to the mix. For an outfit that's very simple but can be flaunted in plenty of different ways, marry an Etro tan blazer with olive chinos. Complement this look with tan leather pumps for an instant dressy look.